If you’re unhappy with the appearance of your smile, you aren’t alone, and while many people consider cosmetic dentistry to be unnecessary, more and more patients are turning to cosmetic dental care to return their smile to a brilliant white, whole, and healthy look. At Pazmino Dentistry, we offer a number of cosmetic dental services to transform smiles for patients from Temple, Oscar, and other nearby locations. Contact our team today to find out more or schedule your cosmetic dentistry consultation. Porcelain veneers are a versatile solution for a number of cosmetic flaws including chips, cracks, gaps, or stains that affect one or more teeth within the smile. Veneers are thin sheaths of porcelain that fit over the fronts of teeth concealing and correcting a number of smile flaws with one simple, comfortable procedure. Most patient should expect to visit our office twice in order to complete their veneer placement. During the initial visit, we prepare teeth by removing a small amount of surface enamel which will allow the veneer to lay flat within patients’ natural smile line. Then, we’ll capture dental impressions that our lab uses to craft a custom veneer. Before patients leave, we place a temporary veneer to protect teeth and allow patients to get used to the look and feel of their restoration. After we receive the final product, patients return to exchange the temporary for the custom porcelain veneer. Metal-free, all-ceramic restoration is one of our services that blurs the line between cosmetic and restorative care. Dental restorations like crowns, bridges, inlays, and onlays can be made from a number of materials including gold and porcelain bonded to metal, and while these materials offer durable repair for smiles, they have some drawbacks that might make a metal-free restoration appealing. Gold restorations are still highly recommended for back teeth as they are extremely durable and less likely to cause additional wear to surrounding teeth than other options. However, gold crowns don’t look natural making them apparent immediately within the smile, and for patients who experience metal allergies, gold can sometimes irritate the soft tissue. Porcelain bonded to metal restorations look more natural, but there is still metal below the gum line which may cause irritation for those with metal allergies. Additionally, the porcelain wears away over time causing the tooth to darken. All-ceramic restorations completely remove the risk for allergic reaction from patients with sensitivities to metal, they look like part of the natural smile, and even as they wear, they retain their natural looking color. Many patients visit our office completely unsure of where to begin their cosmetic dentistry transformation. They know they don’t like their smiles, but they don’t know what the next step should be. That’s where digital smile design comes in. During a cosmetic dentistry consultation, we take digital photos of patients’ smiles. Using specialty smile design software, we’re able to show patients a precise model of what their smile would look like before we ever begin treatment. We can even print off their photos with various treatment options that they can take home to share with friends and families before beginning treatment. Digital Smile Design makes it possible for patients to feel completely comfortable with their cosmetic dentistry solution before beginning any actual treatment plan which is better for patients and the dentists. When patients hear the word braces, an adolescent with a mouth full of metal is likely the first thing that comes to mind, but these traditional brackets and wires are not the only types of braces available. Our team offers correction for crooked, unevenly spaced, or misaligned smiles using the ClearCorrect™ alignment tray system. ClearCorrect™ is a series of aligners that each represent one step closer to the desired result. Patients wear each set of clear, plastic alignment trays for about two weeks and then exchange them for the next set in the series. 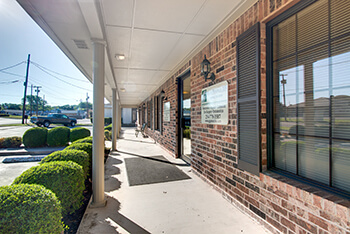 Patients visit our office periodically so we can ensure they are progressing as planned, and most achieve their desired smile alignment within twelve months. Unlike some other cosmetic alignment options, ClearCorrect™ is able to correct even more advanced alignment issues such as over, under, or crossbite.